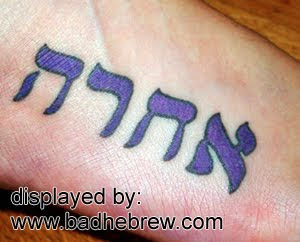 Got good Hebrew tattoos? Send them in! 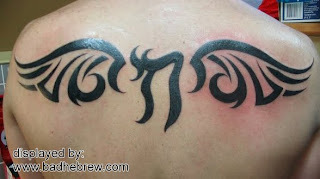 I'm in a great lack of Good Hebrew Tattoos! Please mail your stuff to typotat@gmail.com. 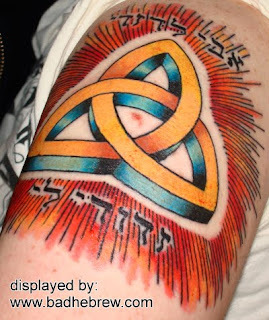 Today we will explore a very disturbing way in which Hebrew tattoos can (and do) go wrong. 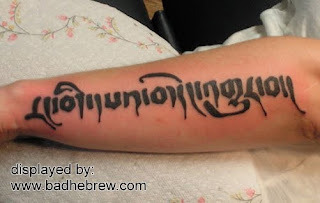 The "Not Hebrew" usually happens when a greedy so-called Tattoo Artist is willing to do anything for a quick buck, even compose a tattoo in a foreign language he doesn't know at all. Of course, this is not Hebrew at all. 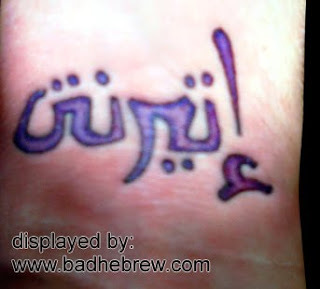 It looks a little bit like Arabic, but it is so sloppy looking that I'm willing to bet it's not real Arabic either. The tattoo of course, spells no such thing. Not in Hebrew at least. 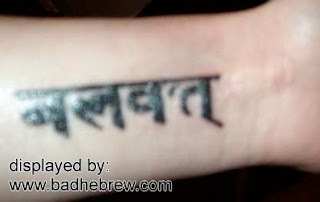 This actually looks like Sanskrit to me. I wouldn't hold my breath for correctness, though. 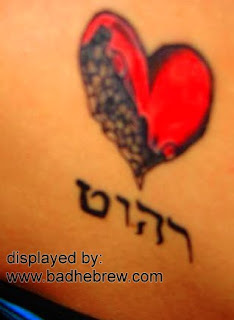 Today's bad Hebrew tattoos feature a special bond - sisterhood. These two ladies decided to let everyone know that yes, they are in fact sisters. Is there a better way to say "Sisters" than to spell it out on your skin in a foreign language? The answer is yes, there probably is. 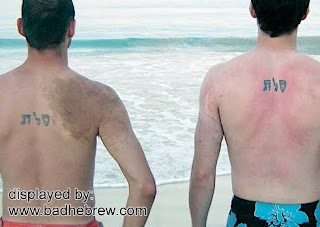 There simply must be a better way to celebrate your sibling bonds than by marking your skin with misspelled Hebrew tattoos. Those two tattoos don't say "Sisters" (in Hebrew: Achaiot), not even close. They can, however, be read as either "She was late" (Echra) or "Backwards" (Achora). This is how you write "Sister" in Hebrew. You can see that it's somewhat similar to the tattoos above (except two letters don't match). And this is how you write "Sisters", plural, in Hebrew. That looks very little like what the victims got inked. We've already established in Beckham's case that this expression is unsuitable for guys, as it speaks of a male lover. But this guy went even further - he managed to misspell it terribly. There are three incorrect letters in this tattoo, the first establishes a love triangle between his father, his male beloved and himself. The other two, mercifully, render this tattoo almost incomprehensible. Really! 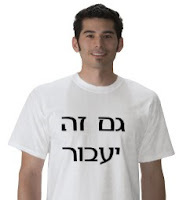 This is pretty much the most common Hebrew tattoo phrase. It can be Googled-up in a second. How on earth can you get it wrong? Remember, in Hebrew lettering every stroke counts, and many letters look similar. If two letters appear just a little bit different, there's a good chance they are actually two different letters. 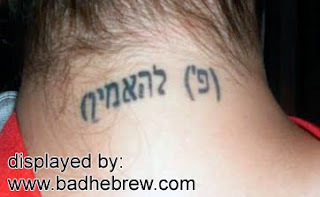 Sometimes Hebrew tattoos can be very weird. When your Hebrew tattoo is designed by a Korean tattoo artist, those chances soar sky high. This lovely piece says, when you read it backwards and ignore final-form letters in mid word: The truth and lands of change on I'll dream. Bad bad bad! This particular Korean artist has been featured here twice before. The first time, he defined Music. Another time, he wrote a love letter. Yes, this guy is still at large, buyers beware! 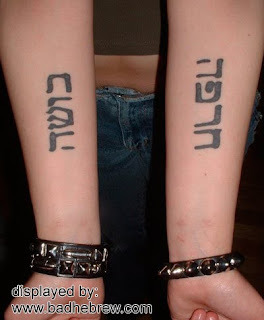 And just like everyone else's, her Hebrew tattoo was rendered backwards. However, this victim's spiritual mistake turned slightly unusual results. This particular reversed tattoo actually has a meaning of its own! Several meanings, even. The intended word "Purity" is pronounced "Tohar" in Hebrew. Reversed, it can be read as "Rihut", which means "Furniture" or "Rahut" - the male form of "Fluent". Unlucky? Sure. But at least it can be salvaged. If the girl adds the letter "He" to the left of her tattoo, she'll have the female form of "Fluent", which is a perfectly acceptable Hebrew tattoo, boasting her great linguistic skills. A tiny bit ironic maybe, but it beats adding the Hebrew word for "Garden", thus turning the tattoo into "Garden Furniture" and opening a new business. I'm sure this girl feels lucky for this opportunity to expand her horizons or launch a brand new career. Really, it could be a lot worse. 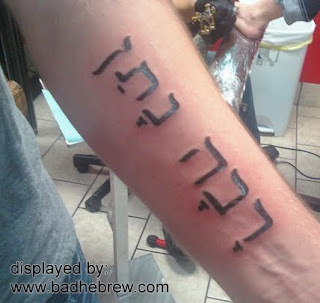 For today's Shabbat Special, I bring you more good Hebrew tattoos! 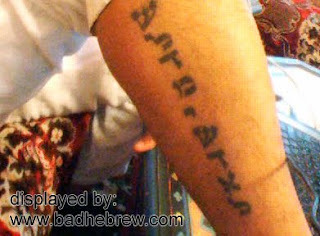 Look at the Hebrew tattoo below, sent in by Reut. A very pretty and cheery design, integrating the Hebrew word "Tikva" - Which in English means Hope. And look at this, a Hamsa tattoo sent in by Dafna. The hand looks quite realistic, and very impressive! The Hebrew word on the three middle fingers says "Aba", which means Dad. And we'll wrap it up with something a little different. A guy who REALLY loves his mother, and is not shy about it. This ended up in Shabbat Special, because well, the Hebrew is completely correct. 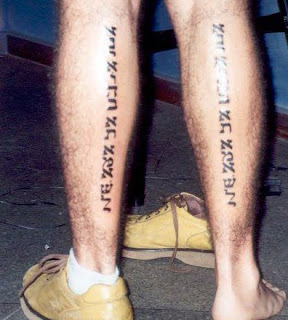 It says "I love my mother" once on each leg! Two questions arise: You love your Mom, but does Mom love this tattoo? Also, doesn't Dad deserve a leg too?